The arrival times are in and Michigan has retaken the lead as of Medicine Hat. Michigan arrived into the checkpoint at 11:20 am, with Minnesota arriving 38 minutes later at 11:58 am. The overall lead in Winnipeg was only 27 minutes meaning Michigan is now in the lead by 11 minutes. Third to arrive at the checkpoint was M.I.T. at a time of 12:24 pm, followed closely by University of Waterloo at 12:25 pm. Last to arrive at the checkpoint for now was University of Missouri - Rolla at 1:05 pm. University of Minnesota had a great charge this morning, and things were looking good on the road as the team sped down Canada's highway 1 at the speed limit. However, the weather's always a factor and high cirrus clouds at first, and mostly cloudy skies near the end prevented the team from maintaining the speed limit, allowing Michigan to gain precious minutes. The team has tomorrow off, as other vehicles collect at the Medicine Hat Stage Point, and then there's the final short stage into Calgary. Driving 2500 miles and yet having the lead separated only by 11 minutes is astounding and Wednesday should prove to be an exciting day. In the meantime, the team will use tomorrow to charge up the car, and make any final preparations for the finish. Wish us luck. Good Luck Team, this has been an amazing race! Cant wait for the finish. You're doing great and keep it up! Noooooooooooooooooooo....i propose a new strategy....drive faster. good luck on wednesday. We'll be sending a little bit of sunshine your way. Good luck! Aaarrgghh! the agony of technology. The GPS updates were sporadic the last miles into Med Hat. The uncertainty of where you were was agonizing. Great job getting into town. Plot some great strategy for Wed.
Keep up the effort. We are extremely proud of you! From a Wolverine I'd like to say good luck. You guys are fierce competitors and are making this an exciting race. Also, congrats on being able to race first through your own home state. That must've been a thrill. 11 minutes is still only a flat tire away from 1st and 2nd place. Give it all ya got in the last stage and run those dylithium crystals...I mean lithium batteries dry. Good luck the rest of the way team and I'm proud to be associated with you all. You have proven to be a great team that has produced a fantastic car. Saturday evening driving back to the motel after the day at Red River College, I had a flash back to a previous time of watching "younger ones" working on race cars, "pine derby cars". I'll bet that more than a few on the team have built a derby car or two. You've all come a long way guys!!! Knowing WHY you won, or didn't quite, is much more important than winning and not knowing what you did to do so. From what I've heard, we know who the best "team" is. So... Go Gophers! You've made us all very proud. Bring it home! Good Luck!!! and have FUN! Minnesota: Finish Strong. Finish Safe. We are all amazed at how quickly you top cars got to Medicine Hat, and how close the times are after 2300 miles. After spending time with the team in Winnipeg, we could not be more impressed with the quality of the car, every member of the team, and the truly remarkable Dr. Starr. We are very proud of you all. Relax, recharge, run hard, and let the solar cells fall where they may. Whatever the outcome of the race, you have shown the United States and Canada the very best of the University of Minnesota. Does anyone else feel the urge to build a solar car again????? Go team! Peter's uncle here again. This looks to be a nail biter! Don't you know some of us are way too old to stand the tension of a photo finish? We might have fibrillations at the very least. Good luck on Wednesday (tomorrow is off, right?). We're with you whatever the outcome. But really, it should be you! Keep it up, you are almost there! Aaron, some other people here want to help you build that solar car you have in your head. Awesome, Alex, then Jon yesterday, now Dan (and of course Brad all along and Paul even if he's not posting) - good to see you all (and anyone else I didn't recognize) from A1. I won't blow smoke, winning is much better than 2nd or 3rd place. But tomorrow is a whole different day with a million possibilities. Give it all you got - we're all behind you and proud, no matter what! Brad - no more talk of building another car. Well, unless you can find someone to "sponsor" my mortgage payments! After I get fired from work for sleeping all day. good luck guys! You're so close. Race hard and safe. Don't try any ditch driving stunts :). I liked the strategy photos. Good times. Brad - I think you are on to something here. Look at the power of the internet - hook up a few servers in parallel at XO Communications in downtown Minneapolis, load ProE Wildfire on em', light up Project Central Server, and let's design the world's first hydrogen powered muscle car for low volume production - right here in Minnesota! Many of you may not know but right in our back yard we have a gentlemen who sits on the Board of Directors of Saleen . . . interested yet? Goro - are you game? 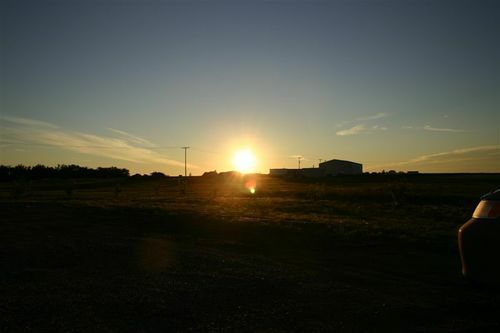 May the sun shine upon your array, may the power trackers track, and may your drivers perform ice cold to the finish. Great job team, and good luck! You will no doubt be awarded for your efforts. I know how much you want to win this--you can just taste it, can't you? I hope you can sense the gargantuan following your wonderful site and updates have created. A few dozen groupies are out there waiting for the updates I forward. As a photographer, I'm an introvert by nature, but I've been telling even total strangers--my dental office manager, for instance--about the rayce. These people respond with great excitement. Have a good rest and brainstorm on Tuesday then go get 'em Wednesday... no matter the outcome, may the winner really sweat it out and earn it. It's an adrenalin rush for us all. Best of luck to everyone. Now all we need is the money I was talking about. You know the answer to your question "Does anyone else feel the urge to build a solar car again????? " before you even asked it. This truly was a once (or twice or three times depending upon how many teams you were on or unless you are Charles) in a lifetime experience and we would all give up quite a bit to do it all over again. If you are not currently on the alumni email listserve or have a new email address you would like to use, please email me at halp0015@umn.edu so I can update our master list. Hey team - Ellie's mom has been sending out updates - your team rocks. Lots of folks are cheering you on. I'm so impressed with your dedication as well as your skill and knowledge. Keep it up and here's to a strong finish! 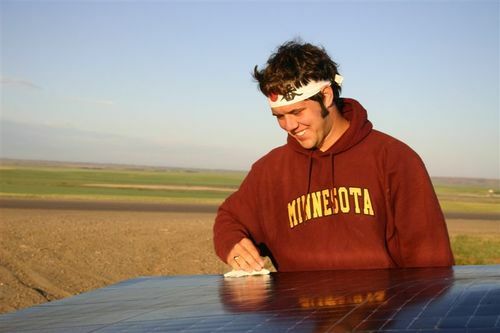 PS - Alex is a Uof MN grad in EE (in 85) - he would have loved to have done something like this! I was deprived of updates for a quick trip to D.C. and back -- just imagine my surprise on finding MN in second, though barely. I can't wait to see what happens tomorrow. Beautiful photos from the last couple of days! You guys rock! We've been updated thanks to Ellie's mom and it's been a source of pride and bragging rights. You have the superior team and the best technology. We're rooting you on! We're sending sunny, non-windy thoughts your way! The whole team is doing a super job! Keep it up. We're all with you in spirit and wishing we could be there tomorrow in person. Go look at the "timing updates" at the NASC website. After penalties were assessed for Medicine Hat--we are in 1st. Can it be true??? I read it the same. Need confirmation!!! We're watching the daily updates and praying for a safe and strong finish! I know you will all be happy to have this wonderful experience no matter where you finish - but COME ON FIRST! We miss you Uncle Mike and are extremely proud of you! Send us pictures when you get home. The timing page does have MN in front by about 30 minutes after 2306 miles. Interesting - the XLS spreadsheet you can download does show that Michigan was assessed 40:00 in penalties. If it's true, it certainly helps the U of M along. Of course I'm sure it's something that can be (and maybe is being) hotly debated. As much as I would like to see this race decided on the road, a penalty is a penalty, even if it is committed right at the end of the race. I hope someone has more details on this. "Nobody panic yet. I just talked to Brent and there's a discrepancy right now as to whether or not we have a penalty. I couldn't get a lot of detail because he had to run into a meeting. It sounds like it should be resolved before the end of the day. 2:11 PM "
Looks like we are all on pins and needles.
" Sweet screamin' Hey-Zeus on a g.d. whole wheat cracker! A 40 minute penalty?" On the last stage at ASC '03. (Barstow to Claremont) Almost every team was given a penalty. Except us. People didnt follow the many "caution corner" signs that "suggested" a slower speed. Evidently they used those as speed limits, not as suggestions. Well like any sport, as long as the officiating is "consistent" no one can really complain too much. We were assessed the 5 minute penaly earlier in the race due to the yellow suggested speed signs, and so if Michigan was burning right through those, they should fairly be assessed penalties for any infractions. glad to hear you're doing so well, but Michigan is sweating because they see B3 in the rear-view. Good luck guys. . .it's something you may not need, but good to have. Looks like both Michigan and MIT got a 40 minute penalty. That doesnt sound like a discrepancy to me. U of MN So La Ka is sooo sweet, this team gives me warm fuzzies...especially the mech team leaders, but not mitch. Penalties or not, this team rocks and has the best car EVER! There I said it. Somebody give trevre a samich. The timing spreadsheet reports that Mich covered 288.25 miles in 4:43:48 (before penalties). That's 60.94MPH. I believe I read that the speed limit is 100KPH (62.5MPH) between towns with long stretches of slower speed limits in Winnipeg and Regina, a handful of medium sized towns and numerous small towns. Seems like it'd be hard to avg so close to full highway speed without speeding somewhere. Borealis III averaged 57.29MPH which is quite typical for a road trip on that type of highway. Keep up the great work!! You've designed and manufactured a world-class solar car and have ran a fantastic race thus far! I wish you the very best in the final leg of NASC tomorrow! Insider info from the Michigan Solar Car blog. "Just spoke to Chito via cell phone. He was actually in Calgary when the penalty was levied, so the details are sketchy, but apparently the 40 minutes comprise a combination of speeding penalties - not all incurred yesterday. They have an appeal meeting scheduled for 7PM (local time) tonight to try to get this sorted out. Cross your fingers. - Andy Warner said... "
If any of the race crew hears something let us know; everyone here in blog land is in suspense. "RACE DISPATCH: Tuesday, July 26, 3:15 p.m. 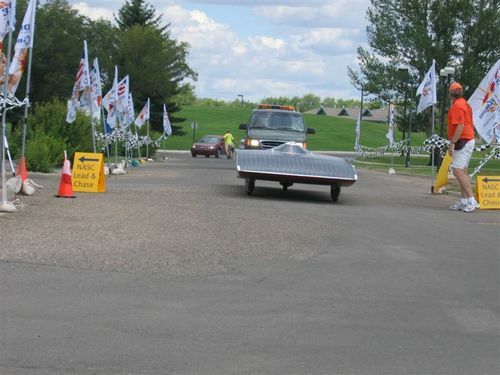 The latest standings posted by officials from the North American Solar Challenge include penalties and have Minnesota leading Michigan by about 29 minutes heading into the final day of racing. MIT is in third. 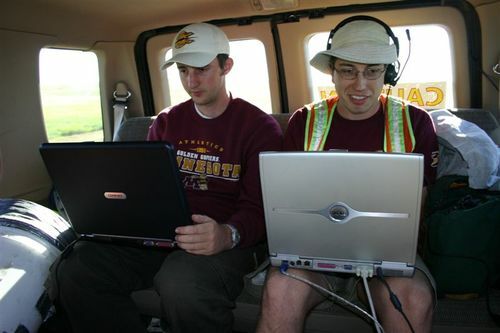 UMR is solidly in fourth place, about three hours behind Minnesota and 25 minutes ahead of Waterloo. Michigan and MIT have apparently been assessed significant penalties. Michigan is currently protesting a speeding penalty, according to our sources in Medicine Hat." "The change is for real. Other penalties could still be assessed for either team, however. Look for Richard's report late tonight or early tomorrow. Thanks to the official who took the time to send the reply. Also, Michigan's blog reports of an appeal meeting tomorrow morning at 7:00 AM. Many positions in past races have been decided by the outcome of penalty/appeal situations. Brad, I think that meeting is tonight at 7pm. Certainly they will be looking for a reduced penalty, such as MIT got earlier in the race. Their two 40 minute penalties were reduced to 19 and 6. I guess we all have to wait for a report late tonight.